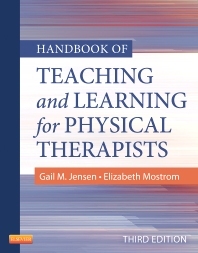 Whether you are practicing in an in-patient or an out-patient facility, academic institution, or clinical residency program, this well-respected handbook gives you the background and guidance you need to effectively educate individuals across the continuum of physical therapy practice. Practical, real-life examples show you how to: incorporate health literacy and needs of the learner; assess and adapt to the various learning styles of patients; use simulations in education; facilitate the development of clinical reasoning skills; and assess learning outcomes and the effectiveness of your teaching. Plus, four all-new chapters and major revisions of all content throughout the book keep you on top of the latest research and best practices. Coverage of the theory and application of educational principles across the continuum of PT practice provides the information you need to improve your skills in the educational process both in academic and clinical settings. Two section format divides content into two parts: designing academic and clinical education programs and teaching students in academic and clinical settings; and teaching patients and families in clinical and community settings. Variety of teaching and teaching assessment methods expands your teaching, learning, and assessment repertoires. Case stories at the beginning of each chapter allow you to see the relevance of the information in the chapter. Threshold concepts highlight key ideas that are important to know. Annotated bibliography at end of each chapter provides resources for further study. Authentic Assessment: Simulation-Based Education NEW! Strategies for Planning and Implementing Interprofessional Education NEW! What Makes a Good Clinical Teacher? NEW! Facilitating the Teaching and Learning of Clinical Reasoning NEW! Patient Education and Health Literacy NEW! Applied Behavioral Theory and Adherence: Models for Practice NEW! "This book successfully fulfills its aim in demonstrating the various aspects of education in both academic and clinical practice environments. The information is well suited to academics, clinical instructors, and a graduate students alike...The use of appropriate examples to formulate the background for each chapter, the threshold concepts concluding the chapter's important take-home message, and the appendices at the end of each chapter further enhances the book's messages...Overall, this valuable publication is a fantastic resource which will help every academic, graduate student, an demonstrator to carry out effective teaching and learning in an academnic or clinical environment, and is highly recommended."